Royal cremations of the past has been a spectacular event, and continues to be so. The Lord Buddha teaches us about the fact of life - one is born, aged, get ill and then dies. A known fact, but we still grieve for our loved ones. But, Siam has a way of sending them off, full of pomp and pagentry for our royals, and fun and all-night party for the commoners, especially in rural Thailand, where the parties include showing a movie outdoors. 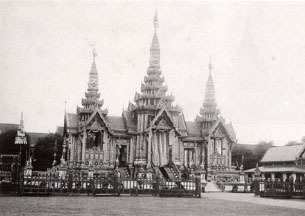 For our kings and queens and higher-ranking royals, we build a special structure at Sanam Luang, the Royal Lawn in front of the Grand Palace. 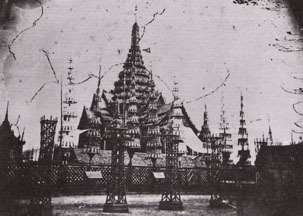 The structure only lasts for the event, then dismantled, and the mostly wooden structures gathered for use in building new temples. 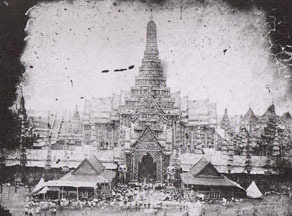 During the Sukhothai and Ayudhya Periods, the ashes were then placed in a newly built Chedi, or Holy Stupa. The cremation structures are grand and with beautiful details, lovingly hand-made for our beloved rulers and their family. The centre-piece represents Sumeru Mountain, which is believed to be the centre of the world, a belief we have adopted from the Hindu religion. Historically, the ceremony takes about 14 days and nights. Day 1 - Bring out the Buddha's remains for religious rites. Day 2 - Display of fireworks before placing back the Buddha's remains. Day 3 - Bring out the remains of past kings and queens for religious rites. Day 4 - Place back the royal remains. 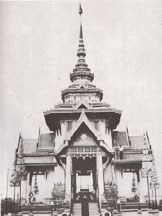 Days 5-11 - Bring out the royal dead body for religious rites for 7 days and 7 nights. The body is contained in a golden urn known as "Kosa" which is decorated in gold, some with diamonds, precious stones, and multi-coloured glass depending on the rank of the dead. 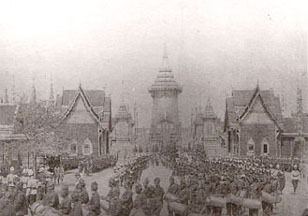 The urn is moved from the Grand Palace on a grand chariot, drawn by hundreds of men, to the specially built cremation structure, or Pra Merumas. The chariot is reserved for kings, queens and most senior members of the Royal Family, all under the king's direction. Days 12-14 - The Cremation Ceremony. It took 3 days for the cremation, because in the old days, wood were used, and it took some time for the whole body to burn to ashes. Nowadays, it takes only hours to cremate the body using a more modern method. 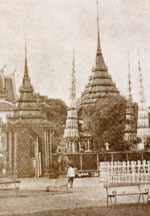 After the cremation, the Pra Merumas would then be dismantled. The woods that used to build the structure is believed to be unholy for any other purpose, except for building new temples around the kingdom.